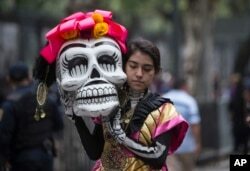 A performer participates in the Day of the Dead parade on Reforma avenue in Mexico City, Oct. 27, 2018. Mexico City dedicated its Day of the Dead parade Saturday to migrants, just as thousands of Central Americans were trekking from the country’s southern border toward the United States under pressure from U.S. President Donald Trump to disband. “The parade ... is dedicated to migrants, who in their transit to other countries have lost their lives, and who in their passing through the country have contributed to a true ‘Refuge City,’” the Mexico City government said on Twitter. A woman walks before her performance in the Day of the Dead parade on Reforma avenue in Mexico City, Oct. 27, 2018. “It’s delicate. ... There are lots of things to think through and analyze,” he said. “Mexico has always, traditionally, been a country of crossings,” said Mariana Villalobos, 33, at the parade. “It has a long tradition in accommodating migrants as well as refugees.